More about babbage's difference engine - what was it supposed to do? 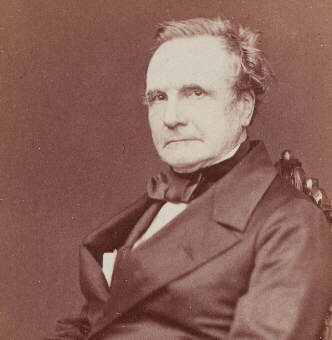 Charles Babbage in 1860 © Science Museum, London. Science & Society Picture Library. Charles Babbage had the extreme misfortune to be born in the wrong century. Late in life he said that he had never spent a happy day and that he would gladly give up the rest of his time if he could spend just three days 500 years in the future. He was the son of a wealthy banker, and was born on December 26th 1791, in London. He was educated initially in Totnes in Devon, where the family had its roots. In 1810 he went up to Cambridge, where he found that he knew more algebra than his tutors. In 1812, the idea occurred to him that a major part of the work of making mathematical tables could be carried out by a machine. This was the start of his vision. To understand this, some background is necessary. In Babbage's day all calculations, other than simple additions and subtractions were done with the aid of logarithm tables. Navigators, surveyors and astronomers also relied on trig and astronomical tables for their data. These tables were vitally important. Unfortunately, they were riddled through and through with errors. In England, the preparation of tables was almost a cottage industry, with the task being spread between many human computers. Frequently these were rural clergymen, who were well educated and had time to spare. Babbage and his colleagues were aware of interesting developments on the continent of Europe. After the French Revolution, the government of France embarked on a huge programme of table making, because there had been vast changes in land ownership and new surveys were necessary. To complicate matters further, the French Government had introduced an entirely novel system of measurements, based on decimal divisions. Both linear and angular measurements were affected (as was, briefly, time - a few "decimal" clocks survive today). This new system meant that entirely new sets of tables were needed and a massive program of calculation was started under the directorship of Baron de Prony. Faced with this immense task, De Prony decided that the only way to proceed was to industrialise the process. He split the work into three parts. A few eminent mathematicians defined the problem and decided the formulas and methods to be used in the calculations. A larger group of mathematicians calculated prime points in the data. A large group of human computers, about 80 in number, filled in the gaps between the second group's calculated points. This group of human computers, mentioned above, were people who only knew how to do addition and subtractions. Indeed some, at least, of De Prony's "computers" were thought to have been hairdressers, who before the revolution had tended the elaborate coiffures of the aristocracy. After the revolution, the body of the aristocracy had little need for either hair or hairdressers and it would seem that the hairdresser's employment in the project amounted in effect to an early form of job creation). The hairdresser-computers only needed to know how to add and subtract, because the calculations that they had do do were based on the method of differences. 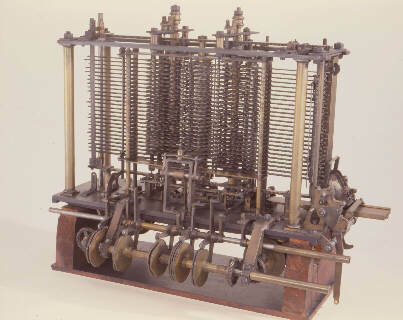 It was Babbage's intention to replace this third group by a machine - the Difference Engine. TELL ME More about Babbage's Difference Engine - what was it supposed to do? Babbage realised that there were several separate sources of errors in the tables. Firstly, there were simple errors of calculation. The difference engine would not make mistakes. Secondly, there were errors of transcribing the results of the calculation. The difference engine would eliminate these errors as well (see below). Thirdly there were errors involved in typesetting and proof reading at the printers. The difference engine, as originally conceived, printed out the results of the calculation, but this was only meant for immediate checking. More importantly, the difference engine was intended to make an impression of a complete page so that a mould could be made to allow the page to be printed without any human intervention. The difference engine would thus eliminate calculation, transcription and typesetting errors and so make the production of tables completely error free. This is a small part of Difference Engine No. 1 and the only major part that was constructed during Babbage's lifetime. It is housed in the Science Museum, London and is still in perfect working order. 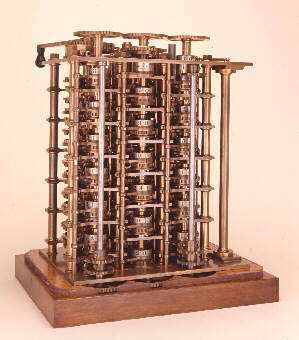 Babbage first constructed a small scale model of the difference engine to demonstrate the principles involved. In 1823 he managed to persuade the government to give him an initial grant of £1500 to enable him to start work on a full-scale engine with the intention of eventually reducing the cost of table making. He envisaged a machine working to 20 figures and 6th order differences. This was a massive undertaking, because not only did he have to design and develop the machine, but he also had to develop the necessary precision engineering tools and techniques in order to make it. As the years went by, Babbage received further grants from the government, but also spent a considerable amount of his personal fortune on the project. By 1833, he had a major argument with Joseph Clement, his instrument maker and Clement withdrew himself and his tools from the project. While the Difference Engine project was halted, Babbage conceived an idea of stunning brilliance, which was to occupy him for the rest of his life. This was the idea of a universal calculating engine, a machine that would perform any series of calculations that could be formulated for it. Smitten with this idea, Babbage lost interest in the much humbler difference engine and also lost sight of the original intention of the whole exercise, that is, the production of tables. The Analytical Engine, as it was called, became an end in itself, an unattainable goal that he struggled towards but never quite managed to reach. Analytical Engine - A portion of the Mill (1871). © Science Museum, London. Science & Society Picture Library. The Analytical Engine was not a logical extension of the Difference Engine concept, but radically different. The Difference Engine was basically an adding machine constrained to function in a particular way. It was ingenious, but not radical. The Analytical Engine, however, was an entirely new departure. Babbage was led towards the analytical engine because of his work on the difference engine but the step was by no means inevitable. Babbage was aware of the limitations of the difference engine. In particular, as the engine moved along the curve, cranking out its computed values for the polynomial, there came a point where the polynomial's values began to move away from the curve. At this point, a new and different polynomial would be needed if the engine were to stay on the curve. The engine would have to be stopped and its wheels would have to be reset to the values for the new polynomial. The engine could then continue to crank along the curve, until the next deviation when the whole process would have to be repeated. - this annoyed Babbage, partly because it offended his sense of correctness and partly because it was a possible source of errors. Babbage outlined and improved his design for the Analytical Engine between 1834 and 1836. In it, he foresaw all the major components and functions of a modern electronic computer. Unlike the earlier difference engine, which he was forever publicising, Babbage worked on the Analytical Engine alone with his vision, in isolation and, one suspects, with a degree of bitter desperation. He had now abandoned any idea of the utility of the finished article and was pursuing his goal, which was to mechanise thought. The engine consisted of several isolated parts, a Mill, or the calculating unit; the Store , which consisted of columns of figure wheels; input devices (the card readers), and output devices (printer or card punches). The operation of the Analytical Engine was to be controlled by punched cards, this idea was not original to Babbage but the principle was borrowed from the Jacquard Loom, which could weave complex patterns. Each thread was controlled by a needle and rod, which could move by passing through a hole punched on the card, or would be held still in the absence of a hole. The Jacquard loom mindlessly fed in its cards one after another. Babbage's approach was, as might be expected, more complicated and rather more subtle. He used cards of the Operations to set the Mill into the correct state to add, subtract, multiply or divide; he used cards of the Variables, which indicated which columns were to be operated on and which column of figure wheels was to receive the result; Finally, there were thecards of Numbers which could represent numeric values for quantities such as π (Pi). "We may say most aptly that the Analytical Engine weaves algebraic patterns just as the Jacquard-loom weaves flowers and leaves"
The cards of the Analytical Engine were not necessarily fed one after the other in constant succession, but sequences of cards could be reused if necessary (equivalent to a program loop), or depending on the result of a calculation, a conditional jump could be made. 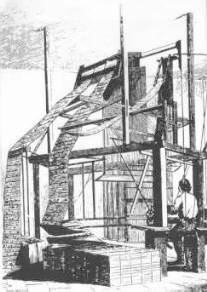 The Analytical Engine was never completed, the illustration above is of a portion of the Mill, which was being constructed at the time of Babbage's death in 1871. It is very difficult to write about Charles Babbage with simplicity and accuracy. His engines and their function confused several Governments in his day and very many people since then. The confusion is compounded because none of his engines was finished and an array of different fragments survive. A brief outline of the chronology of Babbage's engines. 1822 Babbage constructs a small working model of a difference engine. (This has since been lost). 1832 Assembly of a portion of the first Difference Engine. (This is the major surviving artifact). 1834-1836 Babbage conceives the idea for the Analytical Engine & outlines the design in principle. 1842 Government funding for Difference Engine project ends. 1846 Babbage gives up working on Analytical Engine. 1846-1849 Design work for Difference Engine No.2. This incorporates many of the detail design features of the Analytical Engine and is much simpler and more elegant than No. 1. 1852 Unsuccessful attempt to get funding for the Difference Engine. 1871 Babbage dies - the Analytical Engine is incomplete. After his father's death, Henry Babbage assembles a few demonstration pieces from parts left in his father's workshop. One of these was donated to Harvard University, USA. Babbage had little direct effect on the development of the modern form of the computer. Although his designs were intended to come to fruition as mechanical, rather than electrical or electronic devices, they encompassed all the principles of the modern computer. These ideas had to be reinvented in a different guise many years later. "There's my education in computers, right there; this is the whole thing, everything I took out of a book." Perhaps the most important legacy left by Charles Babbage, although still an indirect one, is his contribution to precision machining and standardisation of parts and threads. His engines required a very high standard of precision engineering, a higher standard than was available anywhere in the world when the project started. Highly accurate machine tools had to be specially made for the project and the workforce had to work to finer and finer tolerances. One of the employees was Joseph, (later Sir Joseph), Whitworth. After working on the Difference Engine in Clement's workshop, Whitworth went on to found his own engineering firm where he developed precision surface gauges and a series of standardised screw threads and forms. These "Whitworth" threads, later known as B.S.Whitworth (BSW), remained in use until the 1960s. Before such standardisation was introduced, screw threads cut by different workshops, or even by different machines within a single workshop, were usually not interchangeable. Parts for a large or complex machine had all to be made in the same workshop, otherwise they would not fit together. Standardisation eased the manufacture of large and complex machinery by allowing it to be shared between workshops. This helped considerably with Britain's early development of a machine tool industry. So WHY is he important? It is Babbage's vision that was so magnificent. He peered from his world into ours and he saw a dim and shadowy outline of the future. He forsaw the principles of the modern computer and also wide scale communication systems. His intended implementation of this latter was rather quaint, wires strung between high buildings (church steeples) were to carry paper messages. We may smile at some of his ideas now but his vision was sound. It is a sad fact that Babbage had to wear the shackles of the technology of his day. It is a cruel fact that he was aware of it. Of all the computer pioneers, Babbage was the first to believe that it was possible to duplicate a purely mental process by machinery. The constraints of the technology of the time meant that he had to implement his ideas in brass and iron, to make a mechanical device. In trying to do this with the technology of his day, he faced a harder task than did the early pioneers of the electronic computer. ... We are not aware of its being on record that any partaking of the nature of what is so well designated the Analytical Engine has been hitherto proposed, or even thought of as a practical possibility, any more than the idea of a thinking or of a reasoning machine". Babbage's great strength was that he was a compulsive perpetual improver. This was also his greatest weakness. He was never satisfied with his current work. As each piece took shape, he could always see a better way of achieving his intended goal. On the other hand, if this had not been his nature, he would never have achieved what he did. Remember, at the time of Difference Engine No. 1, the arithmometer of Thomas Colmar was probably the best available calculating machine. Babbage's Difference Engine No. 2 was constructed, from his design drawings, in time for the bicentenary of his birth (1991). This engine is housed in the Science Museum, London. The engine was made using materials that would have been available to Babbage and machined to the same sort of accuracy that he would have been able to achieve. The engine works perfectly, in the way that Babbage intended. More recently (2001), the printing unit that was part of the original design, has been completed. Text Copyright © 2002 A. Audsley.